Send Your Kid to Photoshop School. Hi there, Mom (or Dad, or Grandma, or Grandpa)! The skills and knowledge you're gaining as a Photoshop student have changed your life and opened up great creative possibilities. That's my whole goal as an instructor: to give you wings. Now I've developed a brand-new album class just for the kid in your life to learn like you have! During our course together, I'll show your child the workings of Photoshop CC or Photoshop Elements as we create an awesome scrapbook together! The album is called "My Awesome Life," and it includes photography and writing assignments as homework, plus detailed video lessons to walk them through using Photoshop to create their album. It promises HOURS of fun capturing and choosing photos for the book, as well as adding text and embellishments to finish it off! This is a GREAT opportunity to give your kid a jump-start in photography, technology, Photoshop, design, and online learning, taught by a pro. Our Goal: Have Your Child Fall In Love with Photoshop! I've been teaching Photoshop online for a long time (over 8 years! ), and I've wanted to do a class just for kids, so here it is! 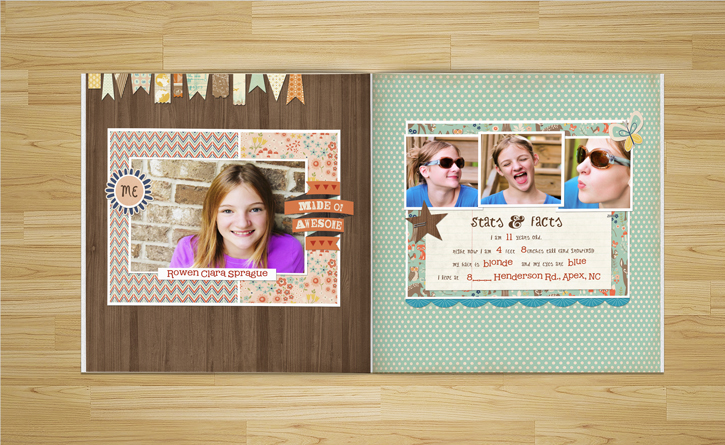 The kid in YOUR life will join me as we create a 20-page digital scrapbook album together through eleven stepped-out lessons. Each lesson contains a homework assignment (they'll receive them all at the beginning of class), plus a video lesson and a downloadable/printable PDF guide that steps them through the lesson techniques. Each of the lesson techniques builds on the previous ones, and this course is designed to teach Photoshop along with creating a great album they (and you!) will treasure forever. Each lesson in total should take about 60-75 minutes as they work along with me to create their page for that day. This course is geared toward kids ages 10-15 (use your judgment here - some kids are ready to learn at an earlier age, or interested later!). Here's a look at the opening spread of the "Soft" colorway. In fact, they'll design and create the last two pages of their album from scratch! This album is designed as an 8-inch square: perfect for holding in growing hands and for showing off to one and all! The kit for this album comes with .PSD files for all 20 album pages, plus front and back covers. They'll also receive a complete kit of patterned papers and embellishments they can use in the album or in other artwork, and a super cute font they can use for all the pages in their book! I've created the album in two distinct color palettes (so there are 40 different pages), to fit EVERY kid! Most of the layout is pre-flattened to keep things easy, but there are plenty of choices to make for design and embellishment! This gorgeous, non-girly colorway has a sweet woodland theme, with patterns created by renowned designer Dani Mogstad. Your non-girly-girl will have lots of fun adding butterflies, woodland animals, flowers and more to this beautiful album! This loud-and-proud colorway is perfect for a teen/tween boy or girl who likes to live large! This colorway has imagery of cameras, stereos, Converse, and has a ton of personality! Kit contents are from CosmoCricket and Echo Park. Your kid will need access to a digital camera and the ability to move photos from the camera to the computer for working on in Photoshop. Cellphone or device photos are a-OK as long as they're moved to the computer! In addition, they'll need a copy of Photoshop Elements or Photoshop CS5/CS6 or Photoshop CC installed on the computer they'll be working on. They'll also need a 60-90 minute block of time each day or so, for about 2 weeks to really dive in to the material. This is great for an after-school project, during track-out or vacation, or for holiday breaks! The best way to learn is by doing, and the best way to DO is to dive in! They might need your help to carve out the time, but chances are they'll be more than eager to dig right in! As part of the class, your kid will need to take a bunch of pictures. That's part of the fun, too! I've got detailed photo assignments for each lesson (the full list is available right when you register), and they include things such as photos of themselves, their family, their friends, their school, their favorite "stuff", and more! The total number of photos is around 45. This is a record you'll both LOVE to have, forever! 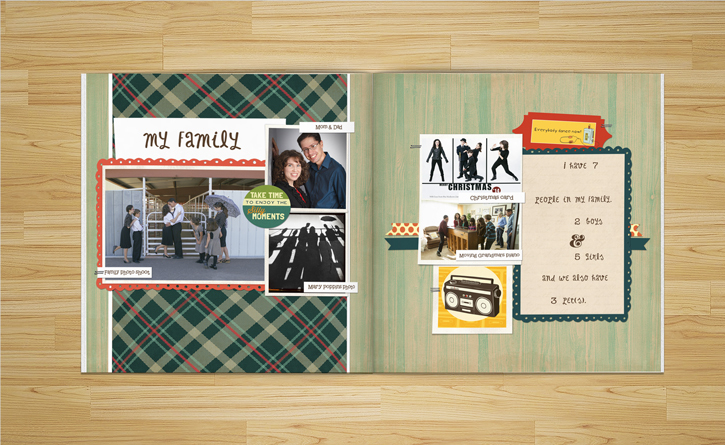 Your kid will be creating their album as an 8-inch square, and I'll show them how to use software from our printing partner, PaperKiwi to assemble the album pages, add the covers and spine, and send it off to be printed. You'll also receive a coupon for a discount off of the already-low $14.99 book price. If you would prefer to have the book printed elsewhere (Blurb or Shutterfly, for example), the files are suited to be printed at anywhere 8x8 book printing is sold, and you're more than welcome to do so! The kid in your life is going to LOVE getting their album! It'll be the best mail day ever! Every kid is creative by nature, and that includes the computer! They'll love learning new skills with each of the lessons, and they'll LOVE progressing toward a super-cool finished product. They'll be proud of all they're accomplishing and will treasure the finished album when they get it in the mail! We LOVE to see what you make, and with any JessicaSprague.com classes, there are many ways to reach out and share your beautiful art or ask questions! Register now, and I'll see you in class! Our class comes with an in-lesson message board and gallery for asking questions and sharing finished projects. These features are private, and restricted ONLY to members of the class, plus myself and the Photoshop mentors who assist me. They'll be able to share safely as they learn! All of the classes here at JessicaSprague come with gorgeous video instruction, broken down into project-based lessons and individual tasks within each lesson. This bite-sized approach to Photoshop makes it easy to understand, and you'll be amazed at what they can accomplish in just 30 minutes at a time! They'll see first-hand what I'm demonstrating, then try it for themselves right there! The freedom to rewind, relisten, and rewatch makes this course easy to follow, even with the most complex techniques. I'm right beside them the whole way! All they'll need for this class are their photographs! I'll provide downloads for everything you'll need to complete each project. This is about THEM - developing skills and knowledge that will last them a lifetime - and I can't wait to share what I know! They'll take the class completely at their own pace (they never need to be online at a specific time), and all of the videos, downloads, and course materials are available to them FOREVER from your My Classes page here at JessicaSprague.com. Register now! I can't wait to see your kid in class!